Judging whether a wine is good, excellent or a waste of money is often said to be a matter of personal taste. Yet a huge industry of online and offline media and gatherings of thousands of judges in various places suggest that wine can be objectively judged. Points and awards are allocated to the good, the bad and desperately trying to be different. The wine industry’s use and acceptance of wine awards highlight that, without knowing exactly which wine they are tasting, experienced wine judges often agree on what makes for a quality wine. Panels of judges will use varied scoring systems with systematic “blind” tasting methods and proclaim the golds, silvers, bronzes and the also rans. But how do they really decide? Being blind in your tasting is literally a cover-up for the bias of labels. ‘Label drinkers’ is almost a derogatory term for some, when people go only for the brand name as if wines are handbags. However, each vineyard with its own climate, history and site differences as well as the winemaker's approach, can have special qualities beyond the famous names and preconceptions based on the label. There have been numerous incidents such as the famous 1976 Judgement of Paris blind tasting in which a transatlantic battle of big reds left French critics in disbelief about the Californian quality in the lesser known labels of the New World Napa wines. This event was re-enacted 40 years later with an Oregon Pinot Noir besting the Burgundies. Judges, therefore, taste from the covered bottle of say Pinot Noir and look for what makes a good quality wine rather than being preoccupied with the name. Wine tasting can make or break sales when medals are given. Commercial forces are clearly important as points, accolades and awards are widely used in marketing so the covered label or blind tasting is a necessity in diminishing a tasters’ expectations. Large-scale wine tastings such as Decanters Annual Wine Awards balance out the sip into the unknown by grouping similar wines with panel judges who are regional or stylistic specialists. Tasting blind therefore is usually a comparison of the similar, rather than say tasting macaroons against pavlova. Tasting is not drinking. As a wine judge, I am often asked: “Aren’t you drunk’ after the 20th wine?” It is all in the full mouthfeel, tasting and the all-important spitting after each wine. Few know just how much water is consumed at wine tasting events, rinsing and clearing the palate. We will first assess the wine’s colour as this will give an indication of age, the condition, ripeness and varietal. The orangey rimmed light ruby of an elegant Pinot Noir is very different from a youthful, dark opaque Shiraz with its full ’body’ on parade. The swirling of the glass to let aromatics lose into the air prepares the taste buds. Anyone who has had a bad cold or flu knows how a blocked nose affects taste buds. The nose can, therefore, tell us about what we are about to taste. When nosing a wine, there may be faults which can be detected by experienced tasters, while we look for intensity and the promises of fruit, floral notes and maybe spice. The aromas let loose by swirling tell whether there is a clean youthfulness or the complexity of ageing where descriptors can really run through lots of comparisons. 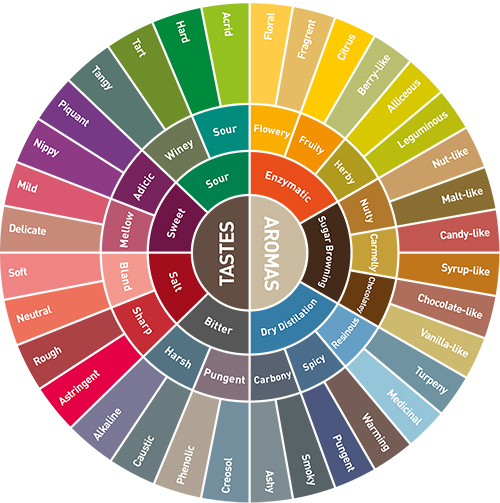 The well known Wine Aroma wheel lists many. Tasting is often said to be a matter of individual preference, yet factors that make up a well-crafted wine have been described for centuries. There are a number of characteristics that suggest a well- balanced wine, from when the wine first hits the mouth, flows across the palate and then finishes with a tell-tale aftertaste. Sweetness is an obvious sensation, but too much may be cloying and heavy unless one fancies a dessert or “stickie” wine. Acidity, as one may find in a fresh Riesling or Sauvignon Blanc, often comes as a citrus element in white wines providing a freshness and backbone more evident in youthful wines, whether white, rose or red. The alcohol in wine links to sensations of weightiness or the body of the wine, and it is here that we talk of wines such as big red Barossa or Napa reds. Too much alcohol without fruit flavour intensity may bring a heating sensation on the taste buds and a sense of excessive heaviness. Tannins felt as a texture, are derived from the skins of grapes. They make for structure in great red wines providing for ageing and complexity and may be felt along with hints of the oak used to mature good reds. The intensity of flavour which each varietal has is important and often where we have preference differences, whereas most tasters will agree on whether a wine has a short, medium or a long finish. That lingering sensation and the final taste may often differ from the entry or first sensations, as a skilled winemaker will leave you wanting a little more. An Oliver Twist trick. A lingering slight dryness or nuttiness calls the drinker back from somewhat sweeter first sensations. All this in a mouthful as we swirl the wine around the mouth to experience it fully. Wine judges certainly have to spit or it will all taste good after the fifteenth. Wine-tasting for competitions involves detailed score sheets and tasting in silence whether for Decanter, Wine Spectator, WSET, AVIO or other detailed point systems. Most wine judging is within systems in which panellist scores are moderated at the beginning of sessions to account for any judge who is overly generous. Points are tallied by others with great care and it is quiet concentration in action. In October 2015 at the Asia Wine Trophy show in Daejeon, Korea. I was tired and happy when we reached the final round after three concentrated days of judging. Our panel had tasted wines from Korea, New Zealand, Uruguay, Moldova, Rioja and Mosel to name but a few. I encountered a last round of aged Madeira and Sherries. They were rich, fruit cake opulence with one minute finishes, a full and complex finale, to the points allocation and description of our panel’s 358 other wines. I did not spit out the last two wines on that day. There are always classic delights to enjoy, as well as the new, in the world of wine.